It’s hard to believe how fast summer has flown by! Here in the COASST office, we’re getting ready for a busy fall season, with upcoming trainings and refreshers in California, Oregon, Washington, and Alaska over the next month. If you’re considering attending a refresher training near you, we highly recommend it – it’s a great way to brush up on your identification skills and meet other COASSTers in your community – and we’d love to see you! Carl and Terry found not just one, but TWO of these rare birds at Griffith’s Priday State Park in Washington on their July 26 survey. Foot is webbed (go to Q2), completely webbed (go to Q3), 3 webbed, 4th free (go to Q5), tarsus not more than 12mm across (go to Q6), nail only (go to Q7), flat heel (go to Q8), small foot – Tubenose: Petrels. 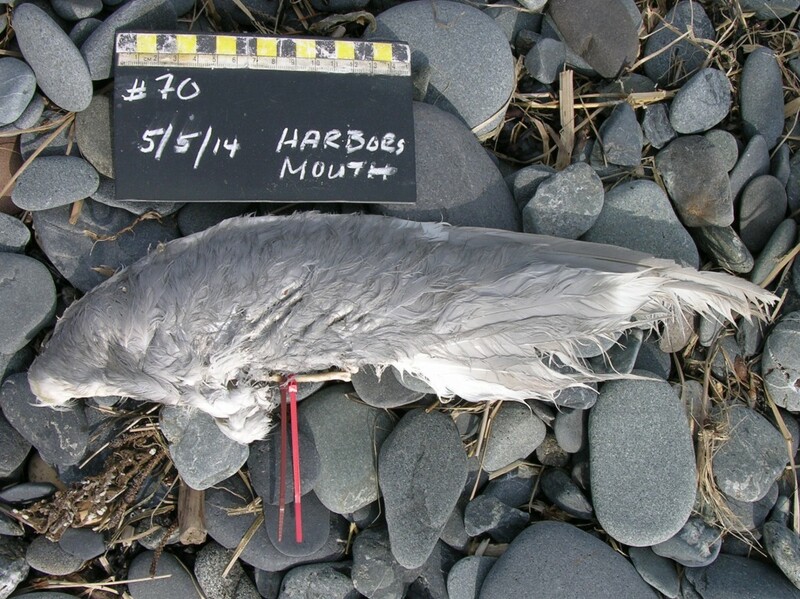 Wing chord greater than 20cm – True Petrels. West Coast guide: select bill “thin and long,” tarus “flat” – review TN5, TN7, TN15. Of these, only the Pink-footed Shearwater (TN15-16) has a pale bill with dark tip and white belly. Charlotte found this bird at North Hartney Bay in Alaska on September 4. Since the wing is well-profiled here, let’s use it. Alaska Wing Key (page 44): Choose “w/ light or dark speculum and/or one or more white patches” (go to Q17), dark speculum (go to Q24), “green w/ buffy stripe above and white below” – bingo – Green-winged Teal. West Coast Wing Key (page 33): Select “secondaries contrasting and dark” (go to Q18), “green w/ tan stripe above and white below” – Green-winged Teal. West Coast Wing Table (page 32): We’re in the ”small” row. Pan across to “patch/speculum,” aka “like a patch but always found in the secondaries, often iridescent with lighter bordering stripes.” Two species: Pigeon Guillemot (PIGU – AL10-11), or Green-winged Teal (GWTE – WF7-8). The PIGU has a white upperwing patch, green in the upperwing? – Green-winged Teal. 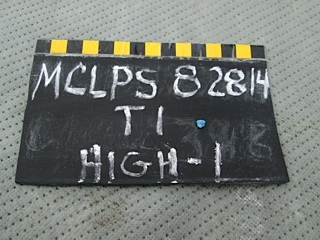 Hank and Linda found this very small piece of plastic on their trial survey of the marine debris protocol. Fragments like these can wash-up in great numbers but easily overlooked and difficult to remove from the environment. 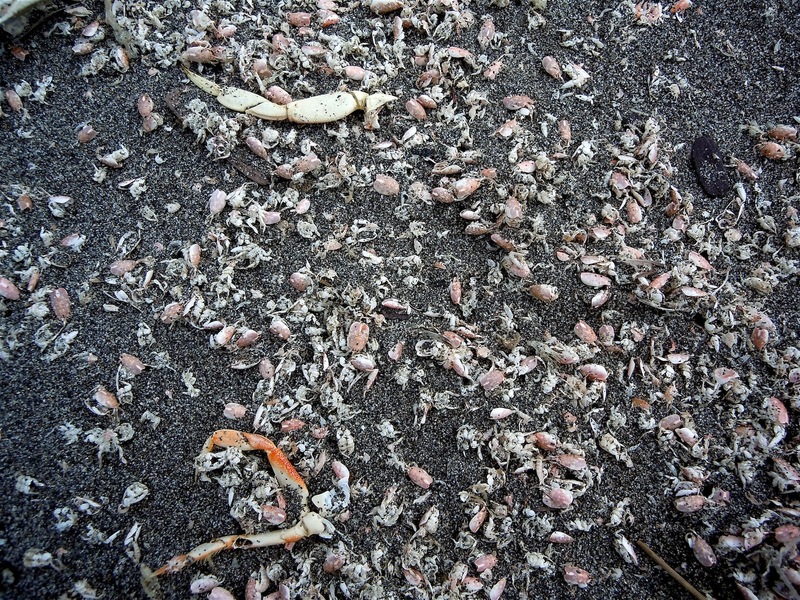 In July, Velella velella hit the shores big time, but for Stone Lagoon beach in California, a different story: Pacific Sand Crab (aka Pacific Mole Crab, or if you’re a bit more geeky, Emerita analoga). These burrowing crustaceans stick their rear into the beach and use their antennae to catch plankton and scrape it into their mouth. Seen something like this on the beach you’ve always wondered about? Send us a photo! 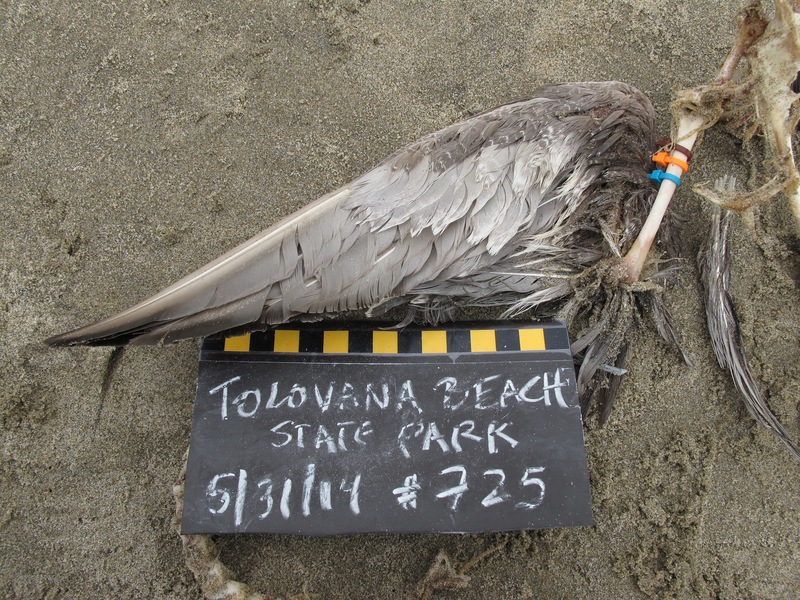 This entry was posted in Uncategorized and tagged Alaska, Marine Debris, Pink-footed Shearwater, Velella velella, Washington on 19. September 2014 by coasst. September is off to a great start! 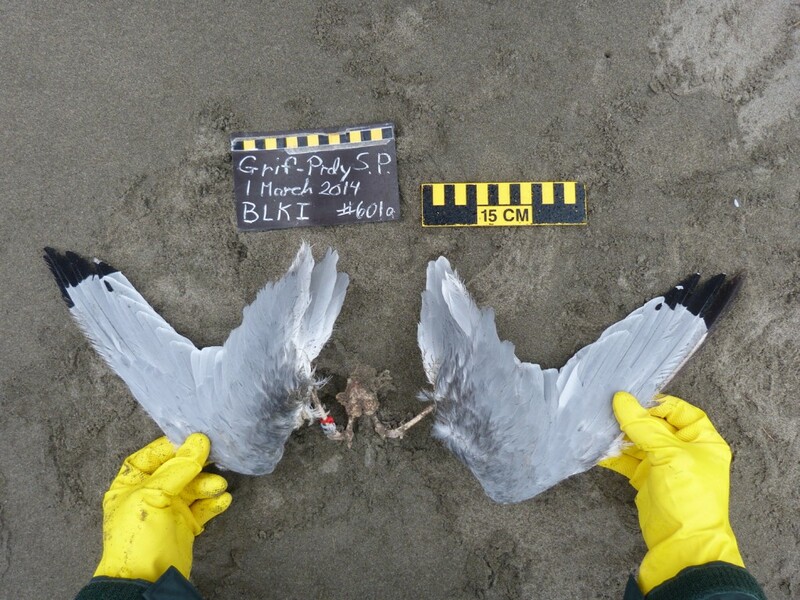 It’s a busy time in the COASST office – we just completed our first marine debris pilot training session on August 23, and we’re getting ready for beached bird trainings in California and Oregon later this month. We’re also anxiously awaiting the return of our amazing intern crew, as many of them are currently away enjoying the last few weeks of summer. Thank you for all of the datasheets and great photos over the past few weeks. Jon and Merrie found the first bird at Oregon Mile 287 on August 14 and Mark found the second bird at Roads End South in Oregon on August 16. With wing chords about equal, which is a chick and which is an adult? On AL1, both guides split Alcids via wing chord, at 15cm. Both of these birds fall into “Small Alcids,” based on that. The West Coast guide directs us to look at 2 species: COMUj (AL4), MAMU (AL14). The Alaska guide directs us to: MAMU (AL17), KIMU (AL19). Turns out the first is an adult Common Murre, in molt (the process of shedding feathers, in this case, all primaries at one time). Even in the absence of a head (mostly dark, so transitioning out of breeding plumage) or feet, note the pale brown wing plumage, worn secondary tips (just a bit of white remains), long body length. The second is a juvenile Common Murre, rare in Alaska but quite common along the West Coast, which warrants a separate species profile on page AL4 in the West Coast guide. Even in the absence of feet or a head, note the fluffy breast feathers, small body size, short distance from wrist to elbow, and fresh, dark, wing plumage. Wow! A super rare bird (only the 5th found by COASSTers since 1999)! 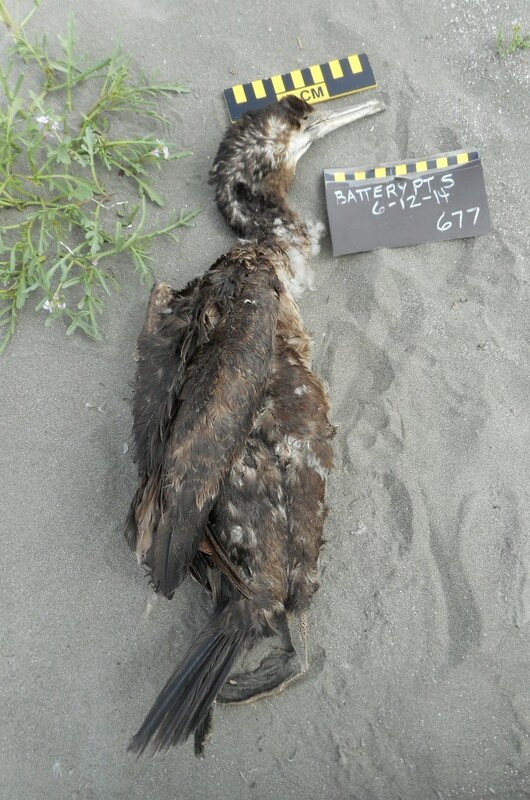 Janice and Vicki found this bird at Damon Point East in Washington on August 25. Using the Alaska and West Coast foot key (page 34, 22 respectively): Q1 select free (go to Q9), four free toes (go to Q10), no toes fused (go to Q11), tarsus less than 150mm (go to Q12), no claws (go to Q13), toe pads not fleshy – Shorebirds: 4-toed. And that’s as far as we can get with the Beached Birds guide. The bi-colored pink-black bill (slightly up-curved) rules out Whimbrel, Long-billed and Bristle-thighed Curlew (bi-colored, but all down-curved). The orange-brown mottled wing with solid orange inner primary patch means this must be a Marbled Godwit. The first marine debris pilot testers from the Ocean Shores training are in action. Data and photos are beginning to roll in. 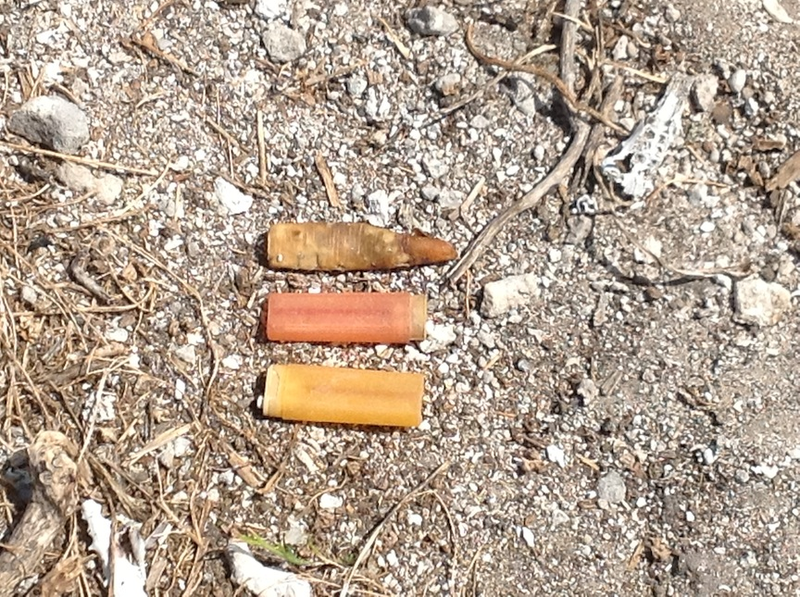 While surveying Old Mill Mark, Lee found these two lighters. For these common finds, color is an important distinction between the two: red is attractive to many seabird species, and red lighters can be confused with squid, a food favored by albatross as demonstrated in the side by side comparison below. 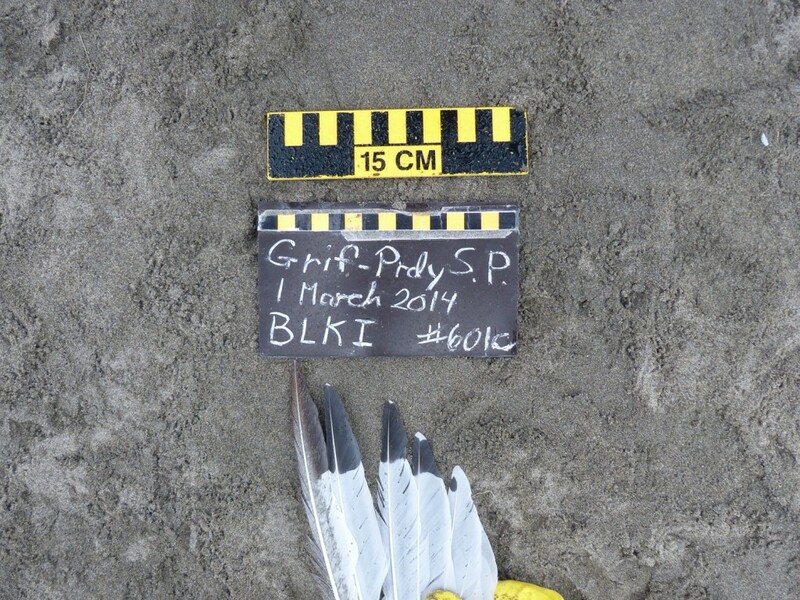 This photo was taken on Midway and shared with COASST by Claude Gascon, Chief Scientist with the National Fish and Wildlife Foundation. 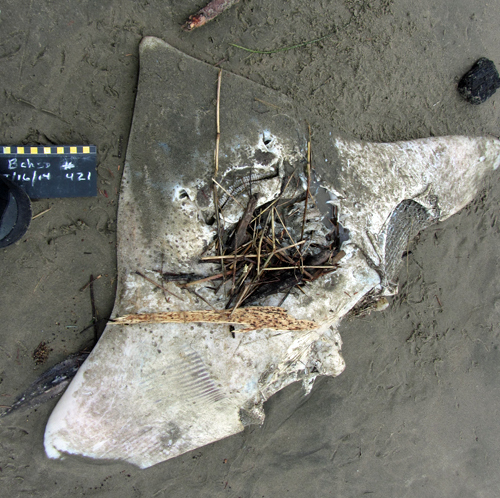 Back in February, Susan found this skate at Beachside State Park in Oregon. As verified Dr. Jerry Hoff, a Fish Biologist at NOAA, this is most likely a longnose skate (Raja rhina), a common species found all along the west coast, ranging from the Bering Sea to Baja California. Skates are bottom dwellers that inhabit mud and silt bottoms in shallow, nearshore habitats where they lay their eggs. Skates bury themselves in sediment leaving only their eyes showing for camouflage. As seen below, skates have multiples rows of small teeth with raised cusps on both their upper and lower jaw line. Skates capture their prey by pouncing on top of it and trapping it against the seafloor. Their diet consists of marine invertebrates such as worms, mollusks, clams, shrimp, and crustaceans, as well as small benthic fishes. Dr. Hoff suspects that the skate found on Susan’s beach may have been discarded by either a commercial or sport fishing boat before it washed up on the shore. Skates are often caught accidentally with otter-trawls, longline, and handline fishing gear. Mortality via bycatch is a growing problem for the species, but their populations are still stable. Though full skate carcasses are a relatively rare find on the beach, finding their egg cases is a much more common occurrence (see What’s Washed In – July 28). 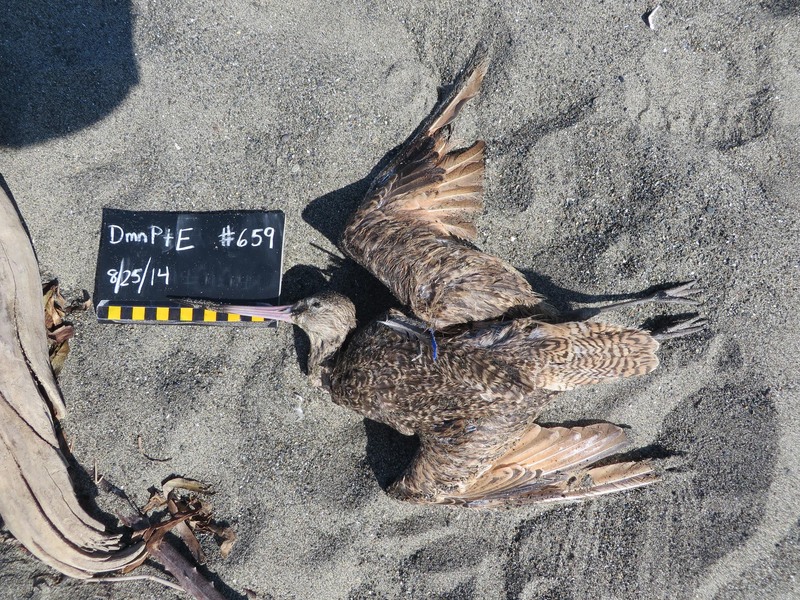 This entry was posted in Uncategorized and tagged Beached bird trainings, Juvenile Common Murre, Marbled Godwit, Marine Debris, Pilot Training on 5. September 2014 by coasst. August is off to a great start! 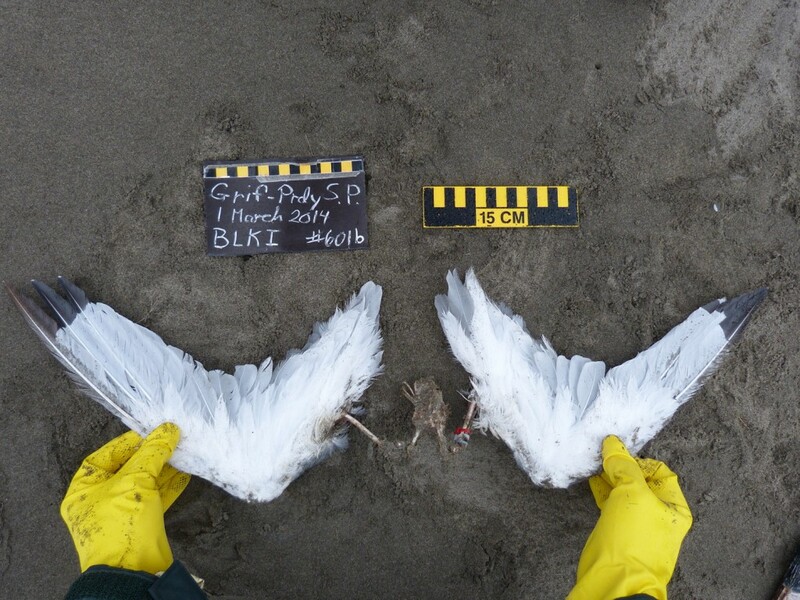 We’ve had wonderful conversations with many of you this week during our summer check-ins, we are excited for a Beached Birds Refresher in Neah Bay on August 16, and we are getting ready for our very first Marine Debris Pilot Training in Ocean Shores on August 23! If you are looking for something to do this weekend, note that this is the last really good low tide series in daylight – a perfect time to conduct a sea star survey at a local rocky beach. Check out the volunteer toolbox to find the COASST protocol and datasheets. 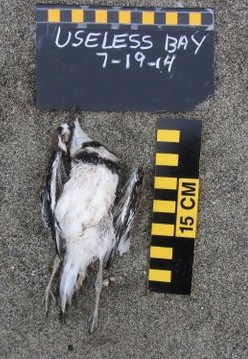 Carol found this bird at Bastendorff Beach in Oregon on June 18th. Scan down to the “extra large” row and across the column headers. Of all these, mantle is tan + white. If you chose gray, that’s okay, but just gray leads us to Heermann’s Gull (LA21) and that mantle is way too dark. So we’re left with: Large Immature Gull – LIGU (LA3), South Polar Skua – SPSK (LA29), Pomarine Jaeger – POJA (LA27), Heermann’s Gull HEEGj (LA21). The SPSK has a very dark wing with white at the bases of the primaries – it’s out. POJA has bright white primary shafts that contrast with the upperwing color – it’s out. We’ve already eliminated the HEEG. We’re left with LIGU, specifically a very bleached/worn Glaucous-winged Gull (you can separate it from the Glaucous Gull – bill all black). Choose “mantle with variable mottling: brown, gray, or white” (go to Q14). White/brown is mixed throughout (go to Q15). Underwing linings (those small feathers covering the bases of the primaries and secondaries on the underside) are not bright white – they’re tan. Still, even if we can’t really decide, we’re left with: CATEj (LA19), SNGOj, LIGU (LA3), CAGO (WF1) or GWFG. Let’s use bill to get there – CATE has a straight, red bill. All the geese have bills with rounded tips and serrated edges. Must be a LIGU! If you choose white-to-nearly-white you’re a bit out-of-range at 40cm. Instead select “mottled mantle brown, gray or white” (go to Q29). Mottling throughout mantle (go to Q30). Underwing pattern is not white, and at 40cm it’s either an eider, Large Immature Gull or Emperor Goose. Bill gives it away – LIGU indeed. 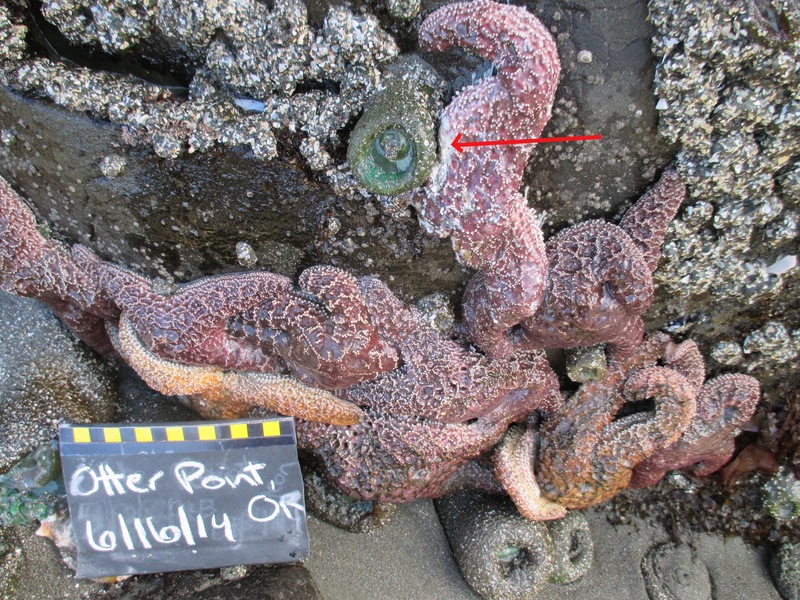 This new COASST species was found by Candace on Useless Bay in the Puget Sound on July 19th. It’s not in the guide, but we can get to family with the foot! Free toes (go to Q9). Three free toes, all front – Stop – 3-Toed Shorebird! On SB1 of the COASST guide, Sanderling, Black Oystercatcher and most plovers fall into this foot type. 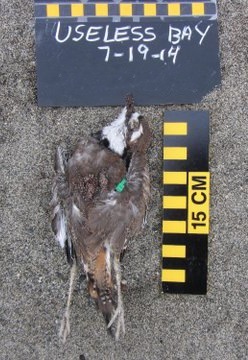 Two other plovers turn up as similar species to this one in Paulson’s “Shorebirds of North America” – Semipalmated Plover and Wilson’s Plover, but only the Killdeer has two black stripes across the upper breast. What is it about nets that helps them catch fish and other organisms? Loops, as Jane demonstrates here, can entangle an animal – allow it to get “in,” but making it difficult to get “out”. 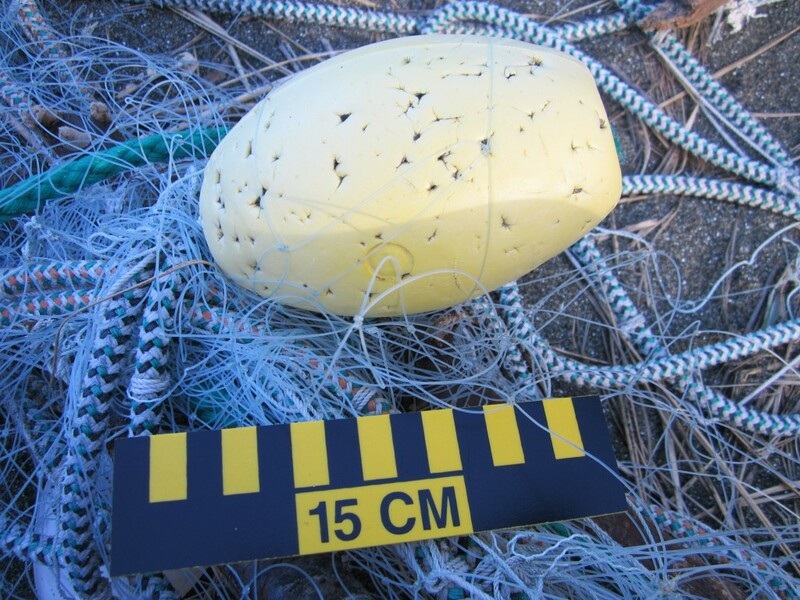 Sometimes nets get lost in the ocean and continue “ghost fishing”. The size and flexibility of the loops determine what animals might get caught. 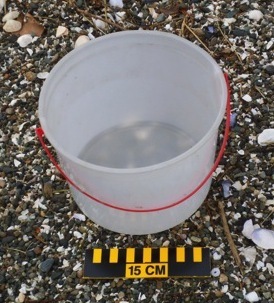 Fishing nets were made for this purpose but there are lots of other common debris objects that also have loops that can entrap animals like this bucket found by Arne on Bainbridge Island (WA). 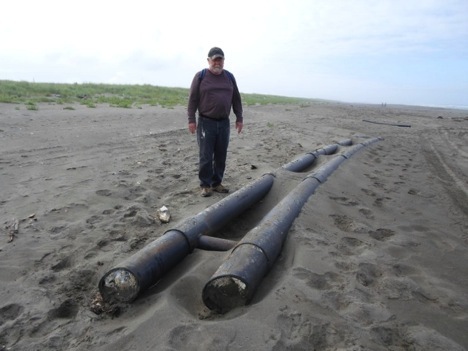 Barbara and Mike found this large pipe had at South Butter Clam (WA) on July 23rd. We are still trying to figure out what it is and where it may have come from. It’s over 30 feet long and filled with Styrofoam. Best guesses so far: the base of a floating dock, raft or pontoon boat. Let us know if you have other ideas! Have you noticed these creatures on your beach lately? Here’s a photo from Stanley at Washway Beach (WA), who noticed a large accumulation of Velella velella at the end of June. These creatures are commonly referred to as “by-the-wind sailors.” Because these colonial cnidarians have no means of movement, they solely depend on prevailing winds and ocean currents. They actually use their semicircular “sail” to catch the wind. 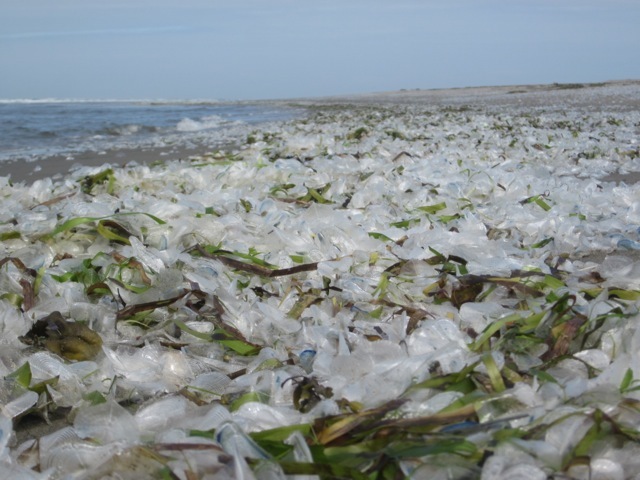 When the ocean and wind conditions come together just right, we see a mass stranding of Velella velella: an event that only seems to occur once every four to five years! While Velella velella do in fact sting their prey when in the water, they are found to be harmless to humans. 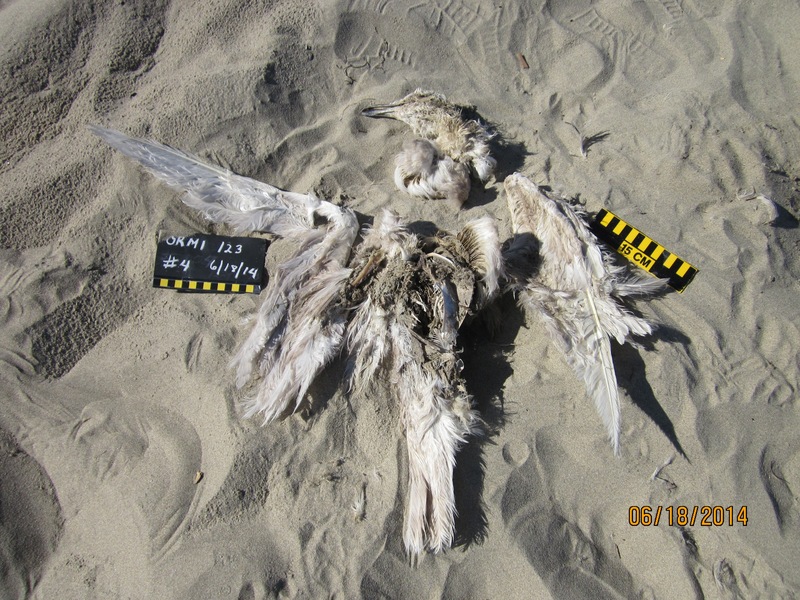 This entry was posted in Uncategorized and tagged Beached Bird's Refresher, Marine Debris, Marine Debris Pilot Training, sea star survey, Valella valella on 8. August 2014 by coasst. This entry was posted in Uncategorized and tagged Marine Debris, Sea Star, Wreck on 9. July 2014 by coasst. 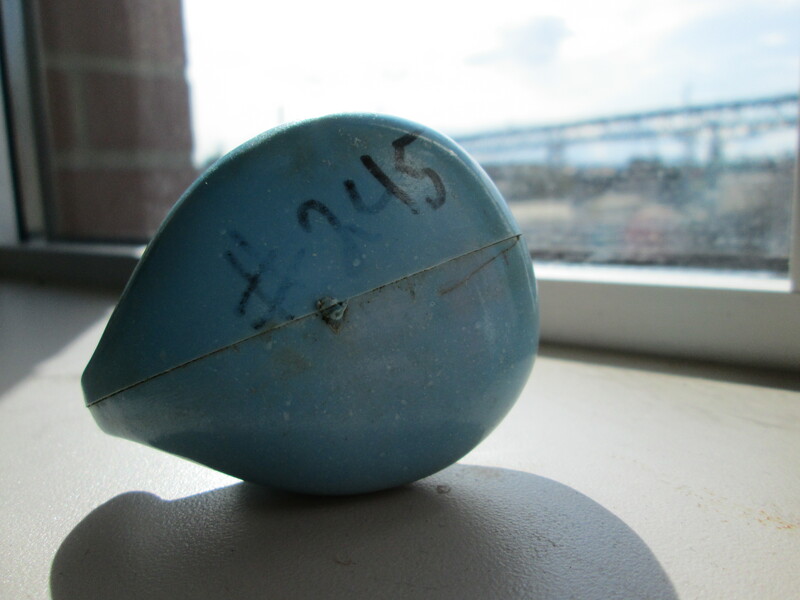 This entry was posted in Uncategorized and tagged Marine Debris, Sea Star on 30. June 2014 by coasst. Over spring break, marine debris student intern, Abby, spent the day hunting for petroglyphs and marine debris on the three-mile stretch of beach from Cape Alava to Sand Point. 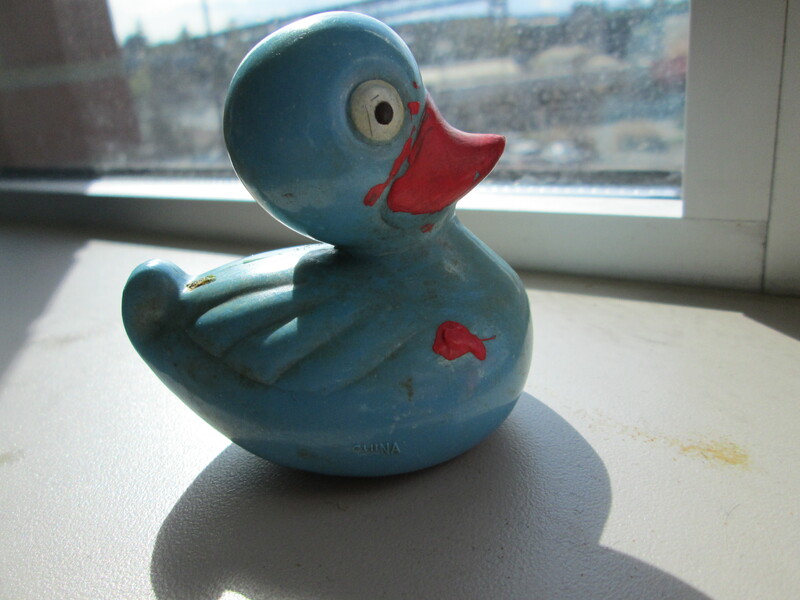 By far the most interesting find was a weathered blue plastic duck, found among some seaweed in the wrack, with a large sharpie-marked “#245” on the bottom of it. Abby guessed it might have been a part of some project, so she brought it back to the COASST office to investigate. Was #245 its race number and this guy made it a lot farther than the finish line? Curtis Ebbesmeyer, a local oceanographer whose work revolves around modeling ocean currents, popularized the use of marine debris as a type of tracking movement of water on the ocean surface. He got his start after a large shipment of 29,000 plastic “Friendly Floatees” bath toys were dumped into the Pacific Ocean in 1992 and for the next 15 years or so people were finding toys from this specific spill washing up on beaches all over the world. Photo credit A. Larson. 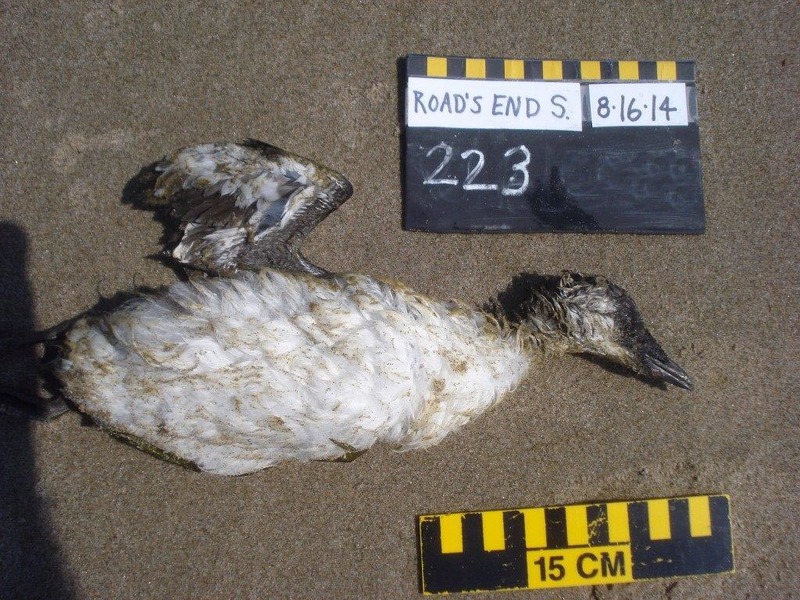 Another example of a beached duck, but you won’t find this guy in the COASST field guide! Picking up on this idea, schools, cities, and various non-profit organizations have taken to releasing batches of rubber ducks into streams and oceans, and relying on helpful beachcombers to report where and when they’re found. While COASST won’t be releasing any ducks or wood blocks (the slightly more eco-friendly version), future marine debris participants will collect information on where and when an object was found, material size, markings and identity to provide insight into source and movement patterns for all debris. 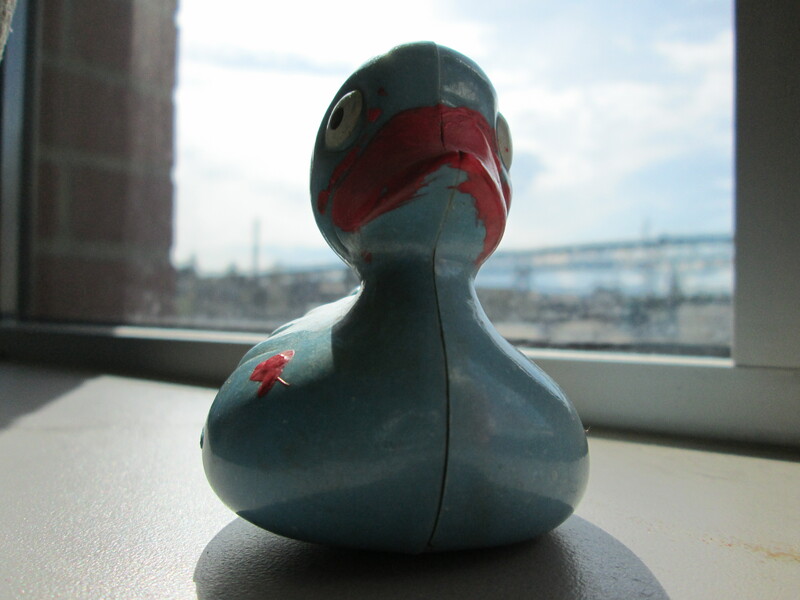 As to the little blue duck? 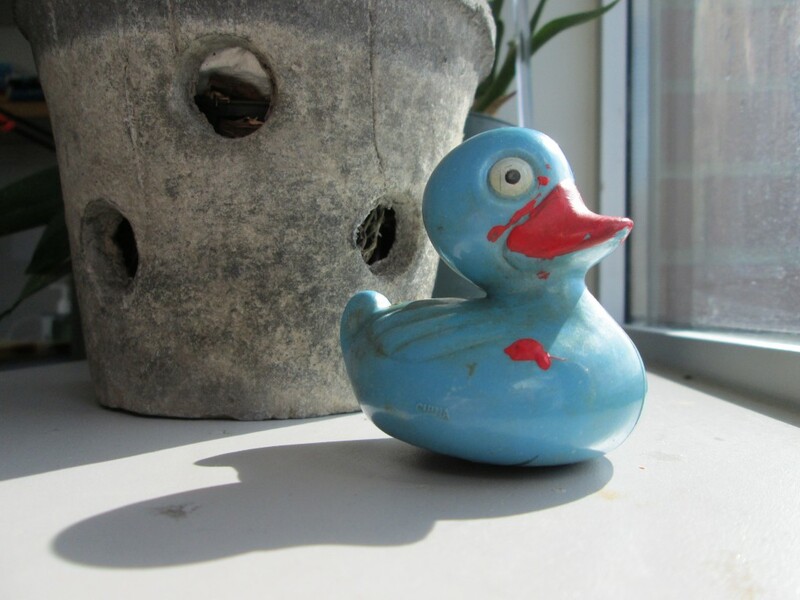 After some CSI sleuthing on Google we found a “vintage” duck of the same style for sale on Etsy. Heidi did mention the Annual Great Olympic Peninsula Duck Derby, a good and local contender, but recent releases feature classic, yellow ducks. 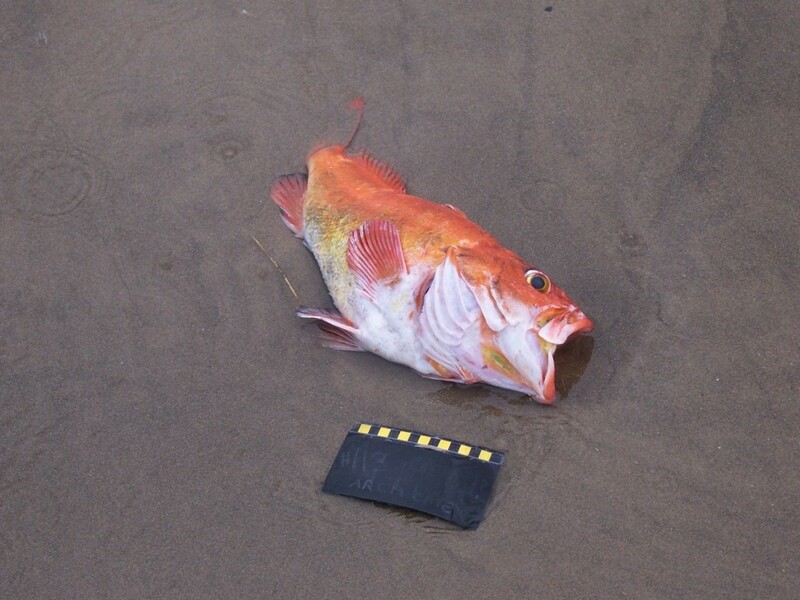 Finally, a potential match – could it be from the San Clemente (CA) Ocean Festival, about 1,740 kilometers south of the spot Abby found it on the North Coast of Washington? 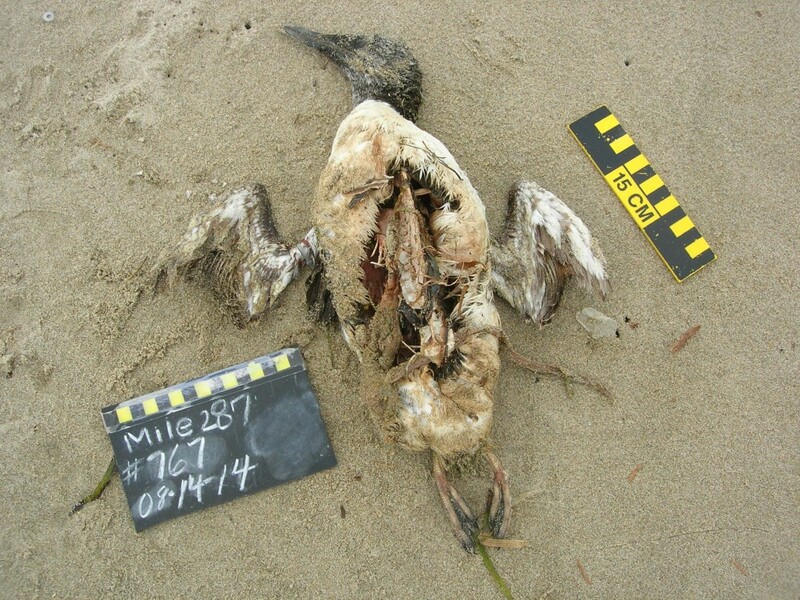 This entry was posted in Marine Debris, Uncategorized and tagged California, Interns, Marine Debris, Washington on 29. May 2014 by coasst. 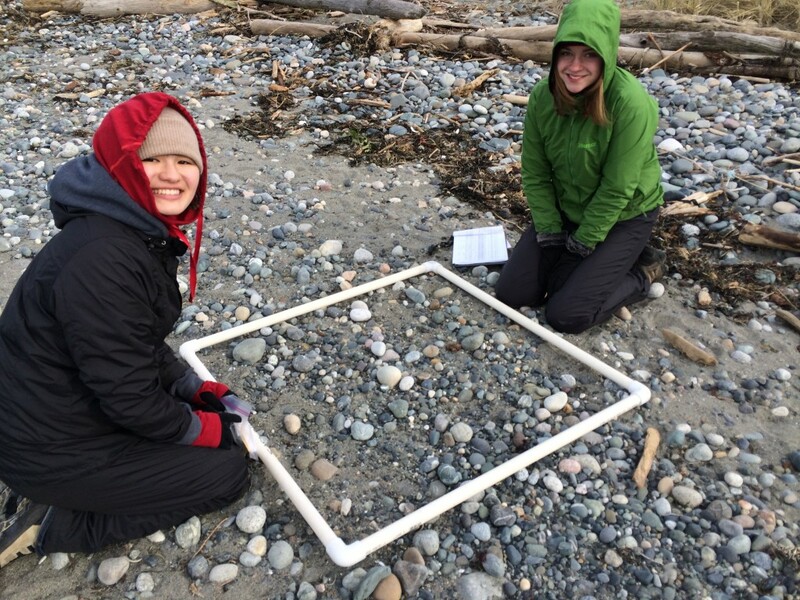 This winter, COASST marine debris student interns embarked on several field trips across Washington to develop and refine a preliminary protocol for the new marine debris program. Interns this quarter included a photo team, Abby and Jessica, and a field team, Angeline and Kaili. A total of 14 beaches so far, from Deception Pass to Ocean Shores! 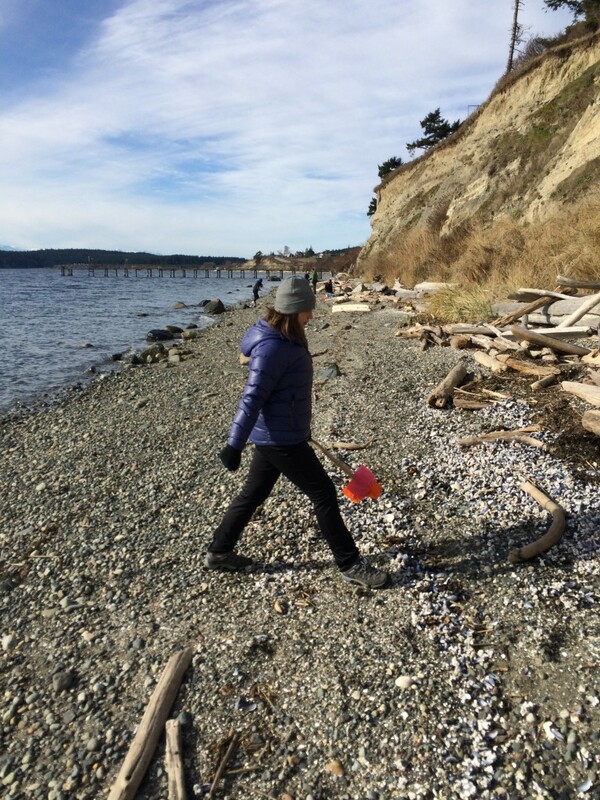 Discovery Park was our first stop, to trial the small debris survey methods – lots of beach glass at both this site and Alki Beach. Kaili (left) and Abby (right) use a 1 meter quadrat (i.e. 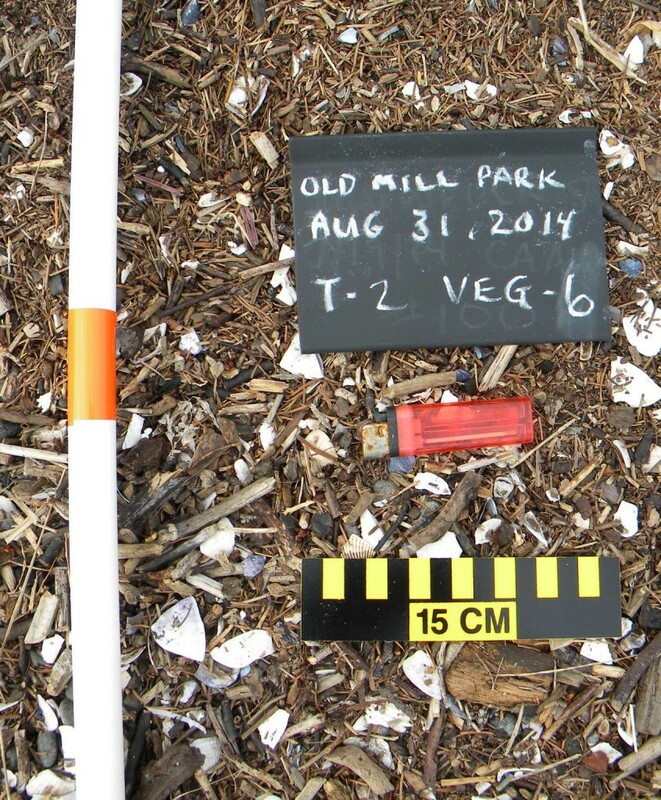 square) to define the search area for small marine debris at Discovery Park (Seattle). Together with service learning students Christie and Yi, we visited Whidbey Island beaches Ala spit, Penn Cove, Joseph Whidbey State Park, Fort Casey, and Useless Bay. The physical differences between these five sites was quite surprising (substrate, wood, wrack, bluff, dunes, exposure) given they’re all within a few kilometers of each other. Special thanks to COASSTers David and Candace, who oriented us to their beaches and shared some (much needed) chocolate! Christie paces the width of the beach on a medium debris transect at Penn Cove (Whidey Island). From the Puget Sound, we ventured to Ocean Shores to check out North Jetty and South Taurus beaches. Super wide, sandy beaches made the marine debris surveys much slower than those in Puget Sound. The following week we returned to Ocean Shores to survey Damon Point and North Jetty to see if debris had shifted/accumulated/changed. We also visited the annual Beachcombers’ Fun Fair where we saw Heidi (COASST staff), and other marine debris enthusiasts, Curtis Ebbesmeyer and Alan Rammer. The collections and displays at the festival (that’s right, 44 exhibit categories, including “assembled unadorned pieces of driftwood”) helped us identify many objects we’ve been seeing in COASSTer photos and on our beach surveys! Out at Damon Point, we almost lost our small debris surveyors (and equipment!) to a rogue wave. For the rest of the trip, we trekked all the way around the perimeter of Damon Point looking for particularly complex/interesting items to add to our marine debris teaching collection. Where did we find the most stuff? At the very tip! 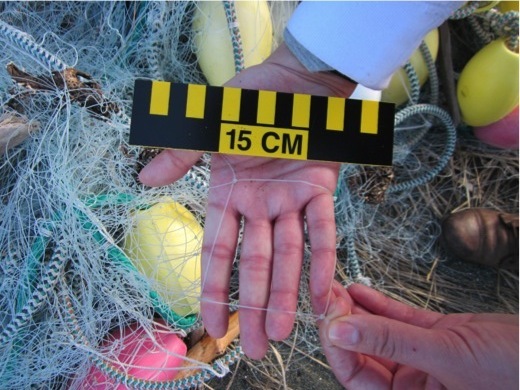 (fingers/points/spits tend to snag debris and birds – just ask the folks at Ediz Hook or Dungeness Spit). During spring and summer quarters, we’ll continue to test and refine the marine debris monitoring protocol, getting it ready for Prime Time! 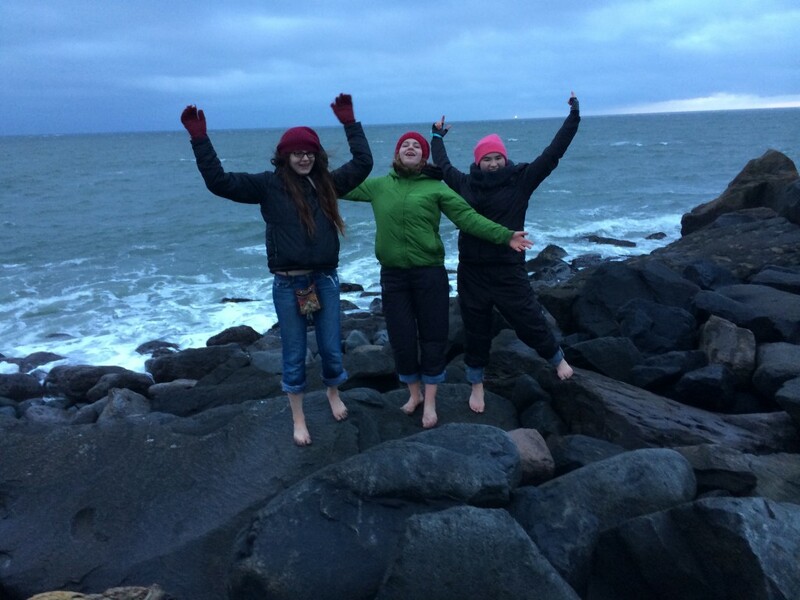 Angeline, Abby and Kaili (left to right) celebrate on the northern edge of Gray Harbor (Ocean Shores) after a long winter’s day of marine debris monitoring (shoes not required). 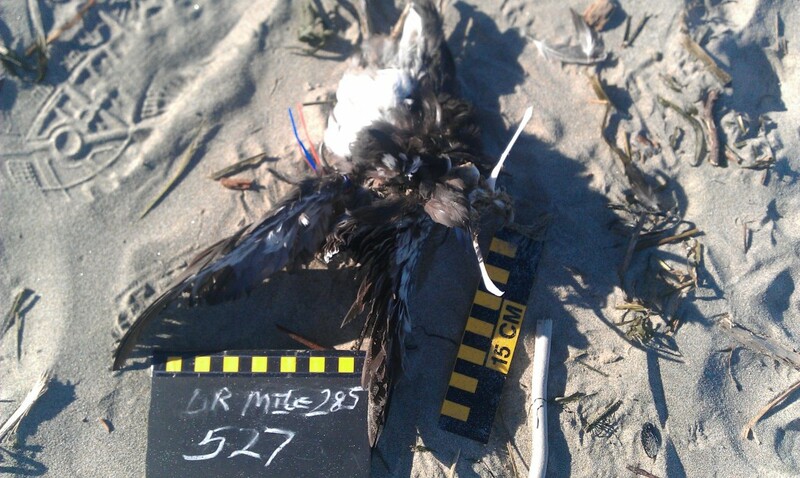 This entry was posted in Marine Debris, Uncategorized and tagged Field Trip, Interns, Marine Debris on 28. March 2014 by coasst. 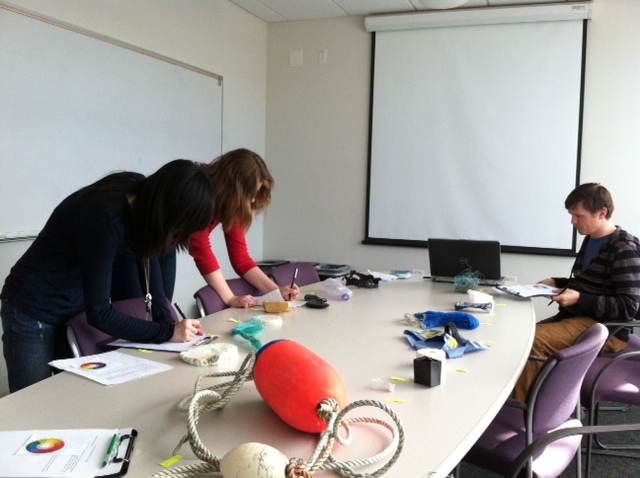 Students Karen (left), Abby (middle), and COASST staff member Charlie (right), assess marine debris objects during a survey refinement session where we asked the question: do Karen, Abby and Charlie agree on the characteristics of each object? Thanks to a recent award from the National Science Foundation Advancing Informal STEM Learning (AISL), COASST is expanding to monitor marine debris. Since December, we’ve assembled a team of student interns and staff dedicated to developing this new program lead by Marine Debris Program Coordinator Hillary Burgess. What have they been up to? Creating a scientific protocol for monitoring debris that collects information useful to the resource management community AND is do-able by COASSTers. 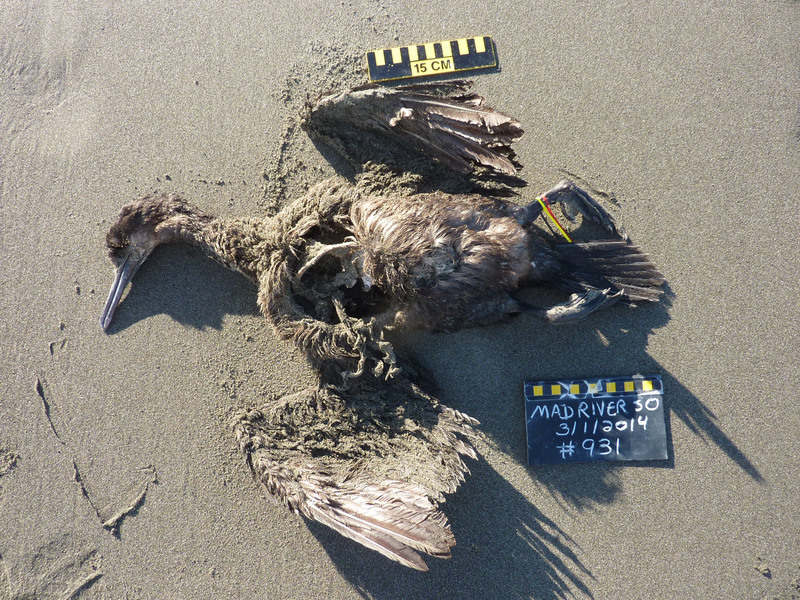 Like the beached bird program, marine debris COASSTers will document basic beach and human use data (wood, wrack, humans, dogs and vehicles) and for this program, the quantity and characteristics of debris objects. 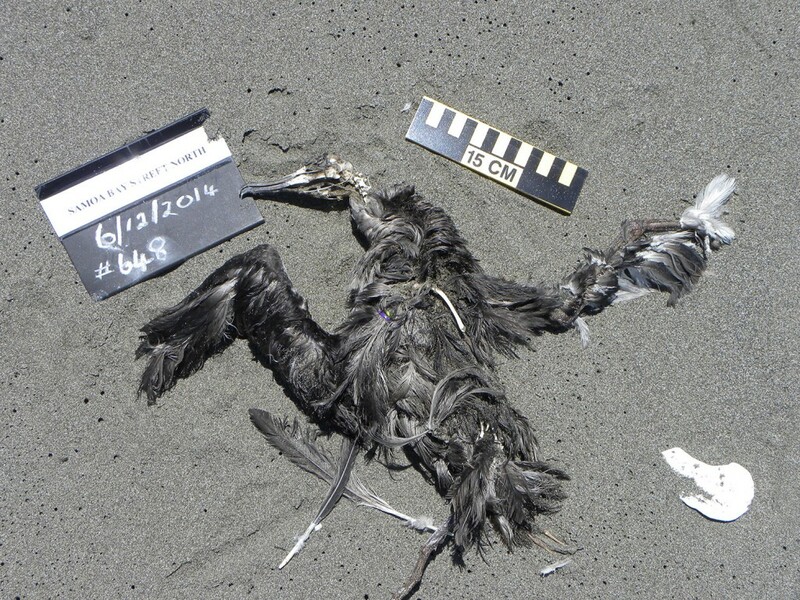 These data link to how harmful debris are to wildlife and wildlife habitat, where debris comes from (some obvious, some we haven’t thought much about), and the path debris take to get to the beach. 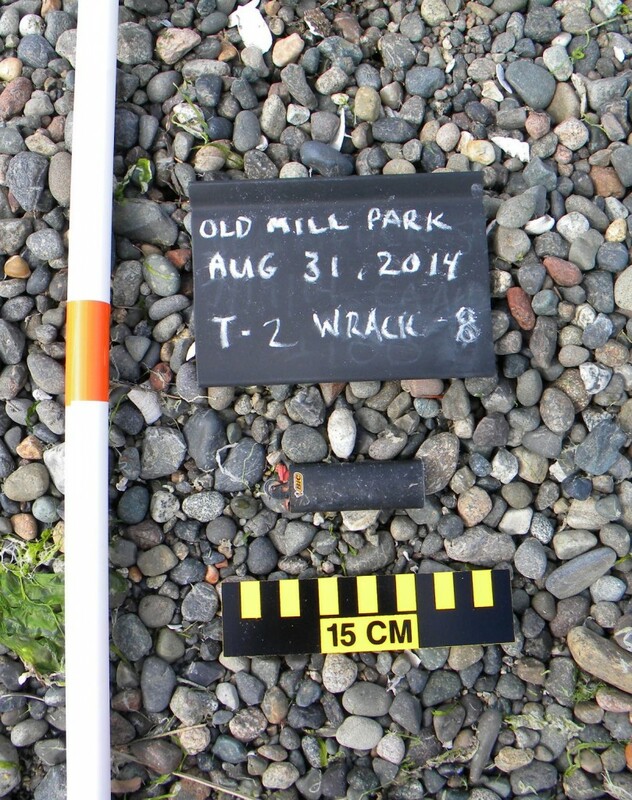 Thanks to the dedicated effort of hundreds COASSTers, the marine debris team hit the ground running and began analyzing a database of over 6,000 marine debris photos from about 200 beach sites in the Pacific Northwest and Alaska. Photo team interns Jessica and Abby are independently assigning characteristics to debris objects – so far, they’ve reviewed nearly 900 photos! Pausing along the way to compare results, analyze sources of disagreement, and make adjustments accordingly, these photos have been extremely valuable in the creation of the new survey. Beyond photos, we’ve also launched an expert panel to help determine which types of characteristics should be included: bite marks? color? weathered? Although it may sound fairly straightforward, marine debris comes in a seemingly infinite array of shapes, hues, materials, and sizes – dealing with the challenging variability has led to many hours of debate and discussion. And lengthy discussion does sometimes lead to more lighthearted moments and philosophical consideration of debris. For instance, is the object a loop? Some objects have very small holes; other objects are rope/line tangled into a massive ball of loops. And why do we care? 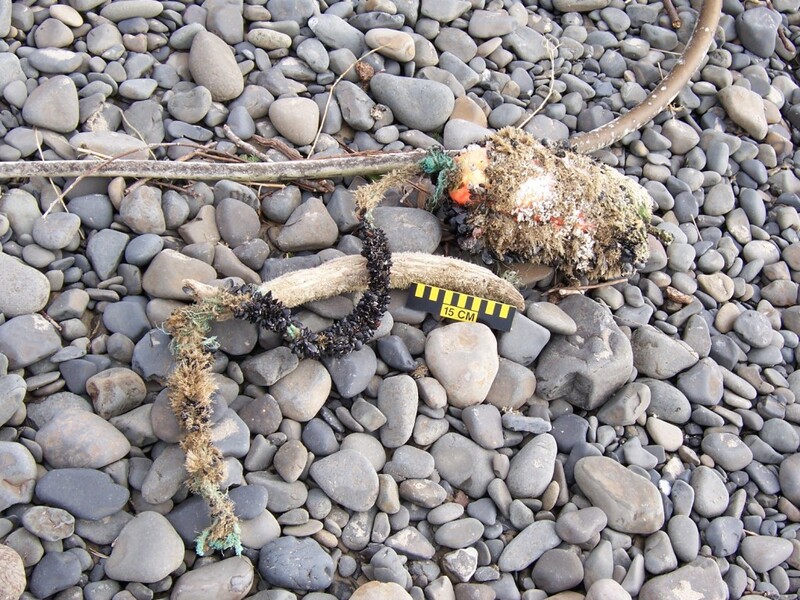 Loops can be super dangerous to marine organisms, causing entanglement and strangling, a threat especially well documented in Northern Fur Seal pups. All this talk prompted Hillary to look up the actual definition of a loop online. We pondered: if the end is connected to the beginning, what is the beginning or the end? Stay tuned for more updates from Hillary and marine debris program students – we’re rapidly making progress toward the 2015 launch of marine debris surveys! 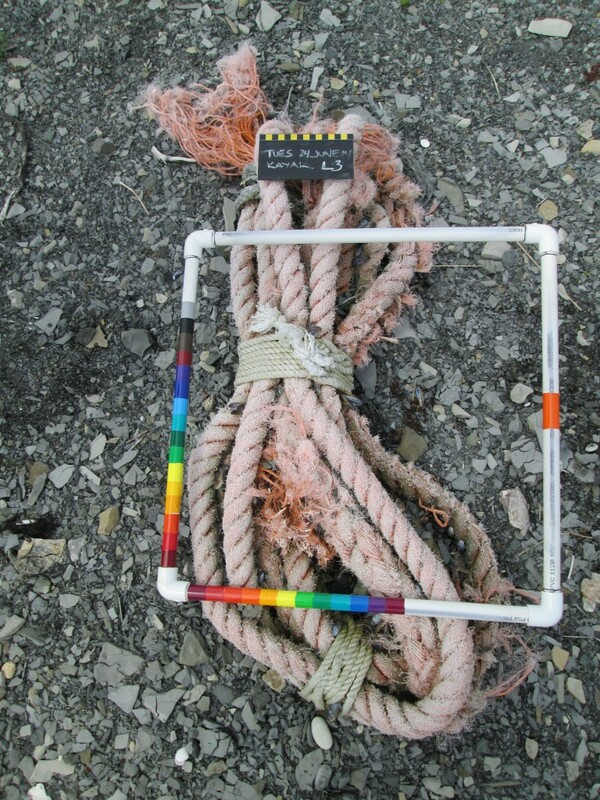 This entry was posted in Marine Debris, Uncategorized and tagged Interns, Marine Debris, Volunteer on 25. March 2014 by coasst. Sara and Peter at Mad River South (CA) just found this last week. Let’s take a look at the feet. Webbed, completely webbed, four webbed toes: Pouchbills. Since the bill is less than 10 cm and the wing chord is less than 35 cm, we know we are looking at a Cormorant. If we take a closer look at the wings, we’ll notice that the outer primaries cut out on the leading edge. We can tell this is a Brandt’s Cormorant because the bill is dark and the chin feathers are tan (Pelagic Cormorant, Double-crested Cormorant, or Red-faced Cormorant). Time for some wing practice! Take a look at these great photos from Terry and Carl at Griffith’s Priday State Park on the South Coast of Washington. Here we have gray upperwings with contrasting dark tips. Using either wing key (Alaska, West Coast), we check the upperwing for stripes – nope. Next, we turn to the primary feathers, noticing that some have white fingernails, but no windows (large white spots, not at feather tip). The inner primary plumage is gray, not white-tipped (Red-legged Kittiwakes – Alaska guide). With a wing-chord of 30 cm, this is a Black-legged Kittiwake. Using the West Coast wing table, the 30 cm wing chord puts us in the “large” row. Our column is “gray mantle with white linings and black tips” – either a Black-legged Kittiwake or a Red-legged Kittiwake. Underside of primaries is more pale than the mantle – this is a Black-legged Kittiwake. 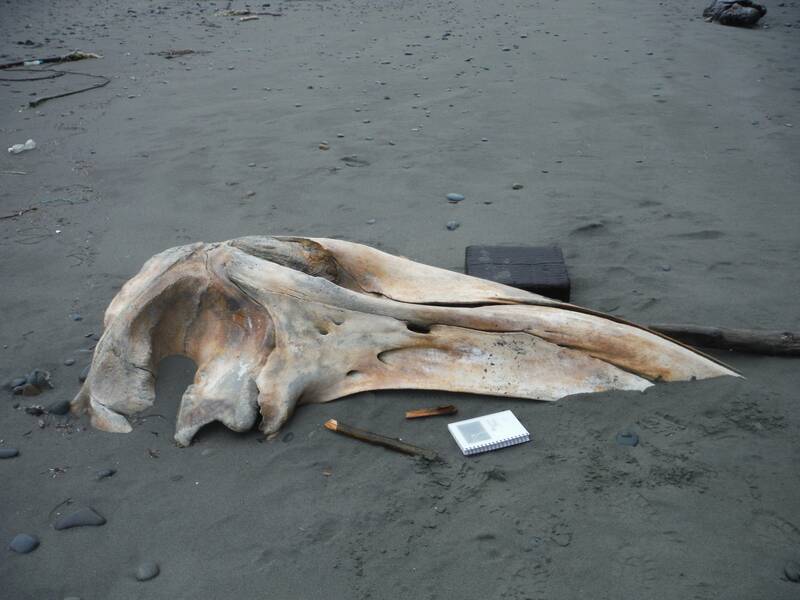 Tom found this Gray Whale skull on his first COASST survey at Steamboat Creek in Washington (beginner’s luck!). After checking in with colleagues at Cascadia Research Collective (thanks Jessie! 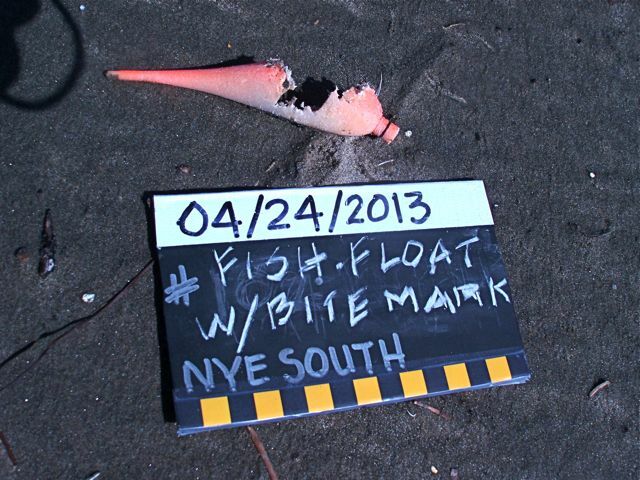 ), it’s likely be an adult gray whale (originally 12m! ), initially found in 1991. 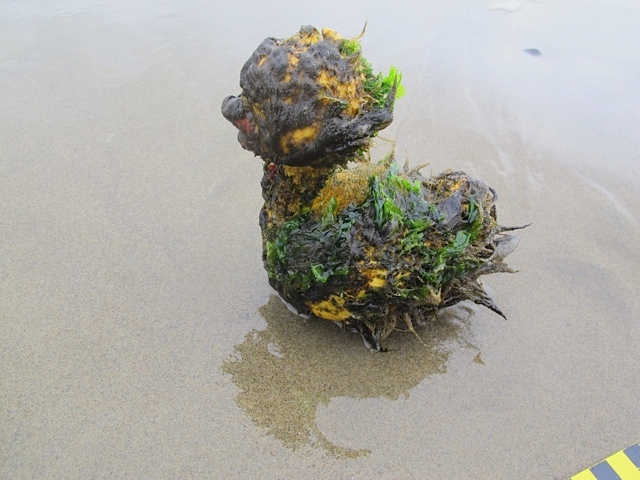 Here’s a crab buoy found by Joanna on Oregon Mile 309, covered or “biofouled” with mussels, barnacles, sponges, and algae. Did you know? It takes free swimming barnacle larvae (cyprids, more than 6 months old) a few hours-to-two weeks to settle onto natural or man-made surfaces. 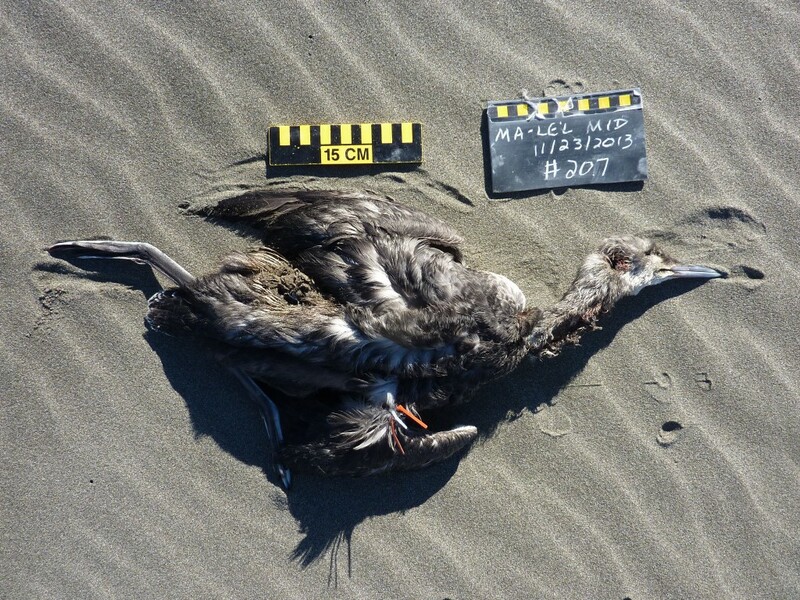 This entry was posted in Uncategorized and tagged Larids, Marine Debris, Pouchbills, Whale on 12. March 2014 by coasst. We’re having a great winter here at the COASST office and have enjoyed hearing about your recent surveys and interesting finds! Hope that you’re all enjoying yourselves on the beach and staying warm. If you need any supplies, just let us know. 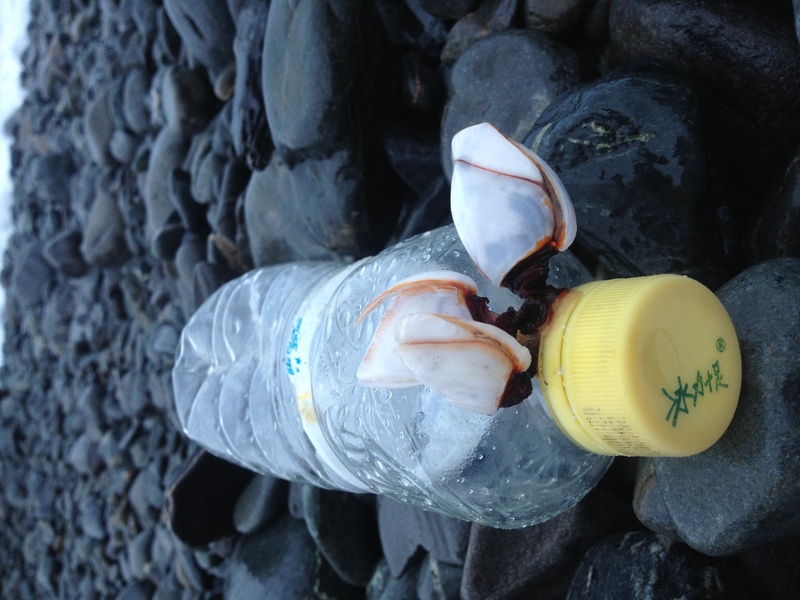 Japanese water bottle found by Tasha on a December survey of Spring Creek Beach in Seward, Alaska. Native goose (gooseneck) barnacles (Lepas anatifera) are attached to the cap. 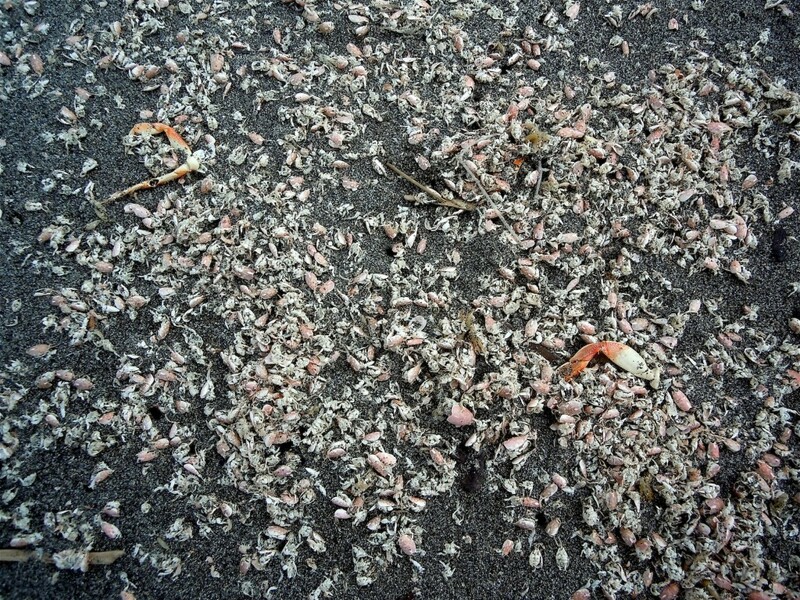 Adult goose barnacles release eggs, which hatch into free-swimming larvae that settle onto all types of substrate. For our state and federal fish and wildlife partners, photos of fouled items showcase the potential for marine debris to transport non-native invertebrates into the COASST range. 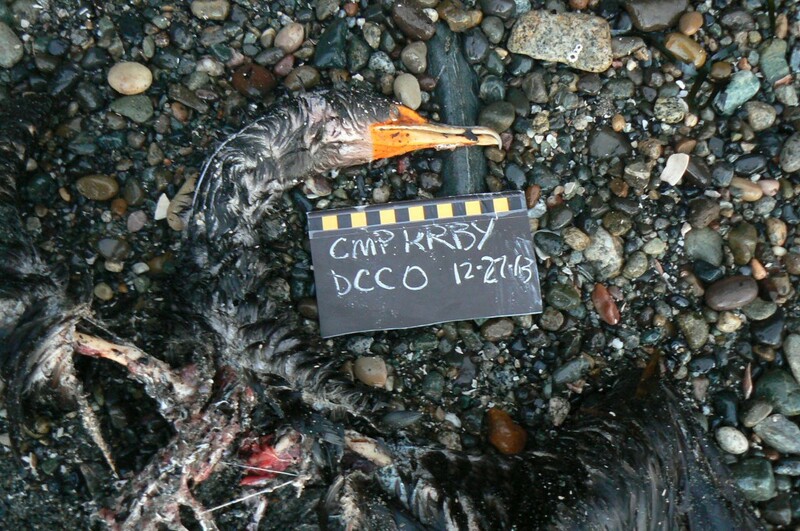 Nancy and Roz found Camp Kirby’s sixth bird ever in December, a Double-crested Cormorant. Using the foot (not pictured here) we get to 4 toes: all webbed – stop – Pouchbills. On the Pouchbill family page, we’re asked to separate by bill (West Coast guide) or wing chord (Alaska guide). Wing is 33cm, bill is 59mm, which puts us squarely in cormorants – there’s only one with a stout yellow-orange bill and throat pouch – the DCCO! We chose Steven and Malinda’s photo from Oregon Mile 285 for a new perspective of a common species. What part of the bird am I looking at here?! 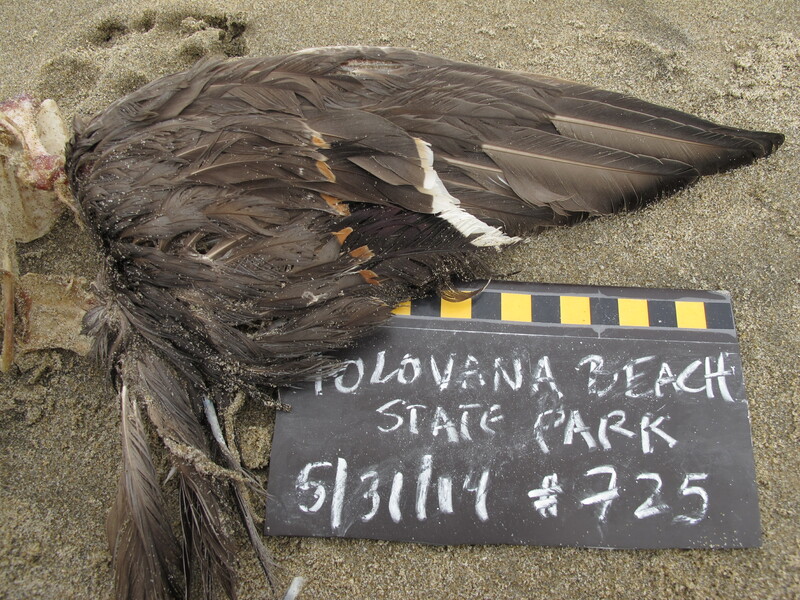 We can help with that: right wing (tagged), left wing, white body feathers. Now it’s time to try out your skills! Using the Alaska guide: dark upperwing, with trailing white secondaries (did you spot them? they’re in the center of the photo), with white underwing linings – murres that’s correct (wing chord = 20cm). Using the West Coast Wing Key: dark upperwing, white stripe on trailing edge of secondaries (subtle on worn wing) – American Coot or Common Murre (COMU has the white underwing lining). 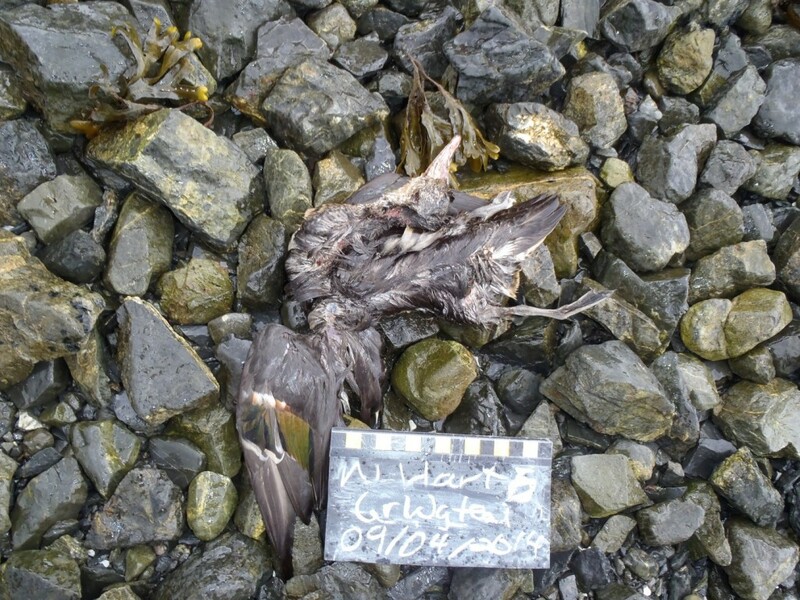 West Coast Wing Table: wing chord = 20cm, dark upperwing, with white linings – Common Murre for sure. Had to dig through a few murres and fulmars to find this one from Sara and Peter, Ma-le’l Mid, Humboldt, California. Check out the foot, upper left. Tarsus width is greater than 12mm across – Loon. 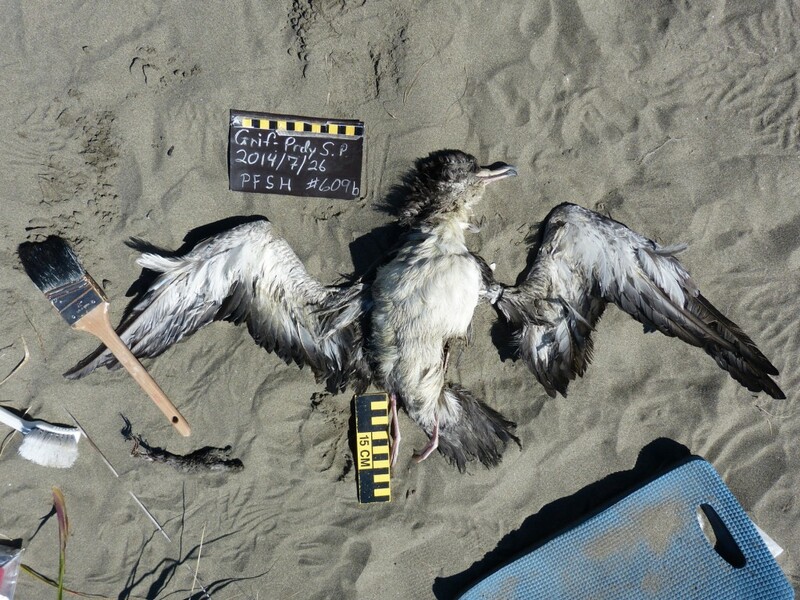 With measurements: 55mm bill, 30cm wing, 70cm tarsus, it’s too small for a Common Loon – dark back (no spotting) and straight bill lead us to Pacific Loon (LO2-LO3 in Beached Birds). 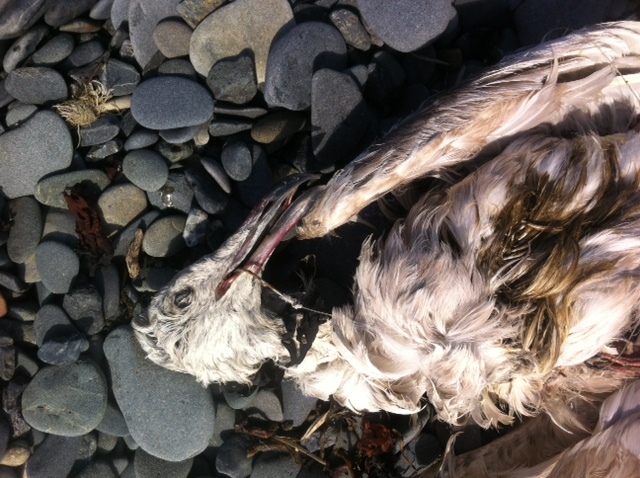 This entry was posted in Uncategorized and tagged Marine Debris, Pouchbills, Seabird on 3. 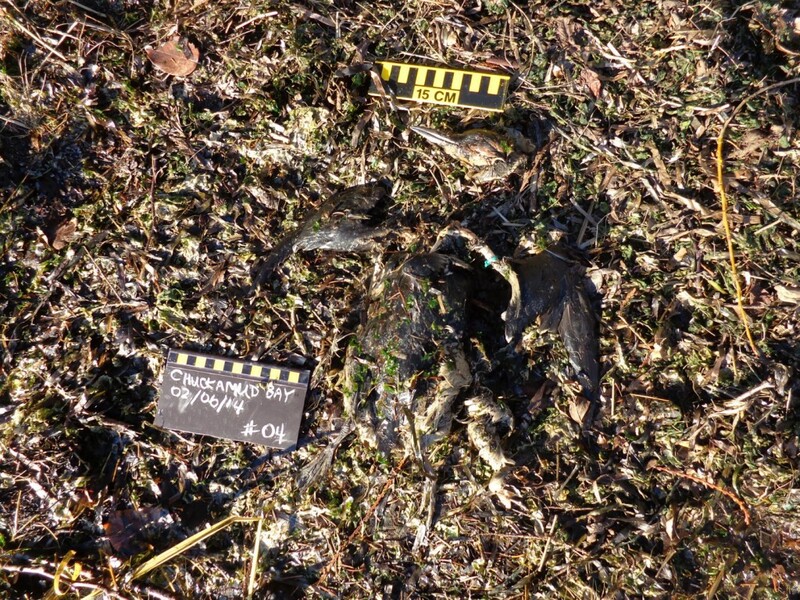 February 2014 by coasst.